The Mossberg 590 Shockwave under the seat of your truck and the Remington 870 in your closet both deserve to be stocked with quality ammunition that will get the job done. 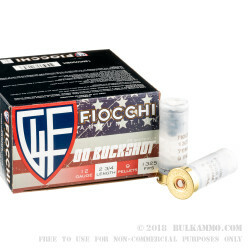 These 12 gauge shells from Fiocchi are built to do just that and are filled with a traditional 9-pellet load of 00 buckshot. This proven load is one of the most popular for military breaching work, law enforcement cruiser guns, and responsible home defense due to its track record for one-shot stops on home intruders or coyotes and big cats that stalk the campsite. 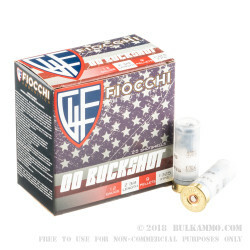 That very same buckshot load is great for taking deer at appropriate distances. 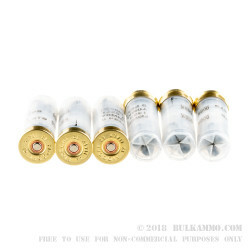 The lead pellets are hardened for integrity, facilitating a rounder shot shape which contributes to more compact patterns and deeper reach into a target. The pellets sit atop a polymer wad that is crushed when the shell is fired in order to mitigate recoil. Beneath the wad is a measure of clean-burning powder that is well-suited to the load for a balance between muzzle velocity and controllable recoil impulse. Those components are contained within a brass head and a plastic hull which work to prevent moisture from ruining dependable ignition. Ignition itself is provided by a mercury-free 209 primer at the base of the head. 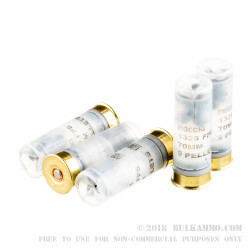 Great ammo, even better price.